The UK’s most important Festival for young aspiring filmmakers aged 16-25 will deliver interactive masterclasses, industry workshops, screenings, Q&A’s, immersive film experiences and networking opportunities, that will inspire and inform young filmmakers and give them the tools to pursue a career in the film, TV and creative industries for its 12th edition. This year’s programme has been curated around four key themes: Storytelling, Production and Craft Skills, The Business of Film, and New Forms and Technologies. Open to 16-25 year olds, the festival will deliver interactive masterclasses, industry workshops, screenings, Q&A’s, immersive film experiences and networking opportunities, that will inspire and inform young filmmakers and give them the tools to pursue a career in the film, TV and creative industries. The Festival offers young people a unique opportunity to obtain access to industry professionals, including masterclasses from screenwriter Gonzalo Maza, the award-winning writer of A FANTASTIC WOMAN (Sebastián Lelio, 2017) and editor Nicolas Chaudeurge, whose credits include the Oscar-winning STILL ALICE (Richard Glatzer, Wash Westmoreland, 2014) and the much-loved San Junipero episode of BLACK MIRROR (Netflix, 2011-). 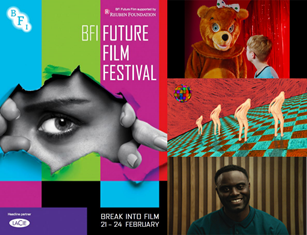 This year’s Festival has received over 1,300 film submissions from young filmmakers across the UK and internationally, the best of which are nominated for the BFI Future Film Awards which have a cumulative prize of over £12,000; the awards will be presented at a ceremony on Thursday 21 February. A selection of the best shorts, carefully chosen from the submitted films by a team of young programmers, will also screen every day of the festival as part of thematic programmes. Tickets for the programme of nearly 60 events are on sale now from just £15 per day, or £45 for all four days. The full programme of events is available to browse online. The Reuben Foundation is lead supporter of BFI FUTURE FILM. LaCie also return for the second year as the Festival’s Headline partner and year-round sponsor of BFI Future Film programme. LaCie are the premium brand of Seagate Technology and design world-class storage solutions for creative professionals.